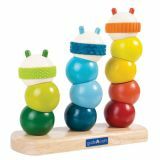 This adorable Caterpillar Stacking set exercises fine motor skills and fun-filled sensory exploration, along with sorting, matching and sequencing skills. 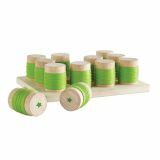 This sweet manipulative toy is made up of rounded, chunky, tactile shapes that can stack to create a variety of colorful caterpillar families. The pegged base allows for stacking multiple angled, color-coded blocks. 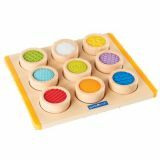 Set includes color-matching activity cards and card stand. Suggested Age: 2+. Long awaited new product in the Language Builder Series! Pre-order now! 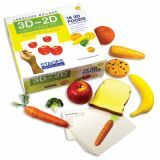 Language Builder 3D - 2D Matching Kits provide the manipulative and photo materials for the most common introductory ABA and Autism Education lesson - matching. The Everyday Object Matching Kit is the most critical object matching kit, as it contains nesting items such as cups, bowls, and spoons... the items used for the very first ABA introductory matching activity. duplicate cards to correspond with each item. 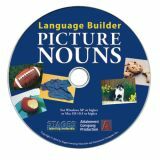 Each of these items were chosen specifically to compliment the similar matching pictures in the Basic Stages section of the Language Builder Picture Noun Cards, so you can move seamlessly to similar matching, sorting and categorization lessons. Early language acquisition begins with the ability to understand objects as distinct and separate. Before learning that pictures represent real items (picture-object correspondence), children learn to match actual physical objects. This is a regular part of developmentally healthy play. Language Builder 3D-2D matching kits provide the tools so you can help children meet these critical language development milestones. Long awaited new product in the Language Builder Series! duplicate cards to correspond with each food. The apples and cookies were chosen specifically to compliment the similar matching foods pictures in the Basic Stages section of the Language Builder Picture Noun Cards, so you can move seamlessly to similar matching, sorting and categorization lessons. The most requested Language Builder product ever is finally here and ready to ship! 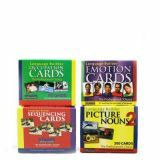 Stages Language Builder Verbs & Action Words flash card set offers 230 Verb Cards to help kids recognize and name a large selection of action words. 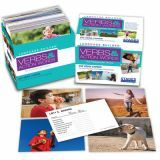 Images in the Language Builder Verbs & Action Words card set show people from various ages, genders and ethnicities engaging in a range of common activities. This variation in actors allows for practice learning gender, pronouns and full sentences. Many of the verb cards also offer more than one example, so you can increase generalization of the learned words. For example, the word "blowing" shows someone blowing a whistle, blowing bubbles, blowing out a candle and blowing their nose. As with all tools in the Language Builder series, the Verb & Action Words images are current and familiar, and are featured in natural settings. Each picture includes plenty of context clues to make identification easy and fun, and to provide great topics for discussion. For the convenience of the instructor, the back of each card is numbered and provides a label for the featured image, and lists suggested activities for which the card is targeted. An included activity booklet provides more detailed instruction ideas. Each hi-gloss card is 3 ½" x 5" with horizontal presentation so the sets work together seamlessly with the other 1000+ images in the Language Builder Series.